Will Tech win the ACC Championship in 2015? With the return of quarterback Justin Thomas, four-fifths of a stellar offensive line and nine of 11 starters on defense, Georgia Tech will be the best team in the ACC this fall — and they will prove it when they beat Florida State in the ACC Championship Game. Yes, there are plenty of question marks on offense, specifically at receiver and running back. The loss of wide receivers DeAndre Smelter and Darren Waller, B-backs Zach Laskey and Synjyn Days and A-backs Charles Perkins, Deon Hill, BJ Bostic and Tony Zenon seems to be an almost insurmountable obstacle for the Jackets to overcome. In the eyes of most media outlets it is; many publications have the Jackets ranked towards the bottom of their preseason polls. To be fair, this is a valid concern. The above players accounted for 60 percent of the rushing yards and 90 percent of the receiving yards for the entire season. That is a lot of ground to make up. But the key stat here is that the Jackets return the player responsible for almost 100 percent of last year’s offensive production: Justin Thomas. As a redshirt-junior, Thomas already has a year’s worth of starting experience, in which he amassed 1,719 passing yards and 1,086 rushing yards on his way to leading the team to victories over Virginia Tech, Clemson, Georgia and Mississippi State. Given that an option quarterback plays such a unique and read-based role in a team’s running game (as opposed to pro-style quarterbacks who simply hand the ball off), Thomas also deserves at least some credit for the roughly 3,700 rushing yards the rest of the team produced in 2014. Any marginal drop-off in offensive production should be made up for in what looks to be the best defensive unit Coach Paul Johnson has fielded at Tech. The Jackets return almost their entire defense. A stifling defensive line laden with talent and depth combined with a secondary that tied for tenth in the nation in interceptions last year should prove to be a dangerous combination in Coach Ted Roof’s 4-2-5 alignment. 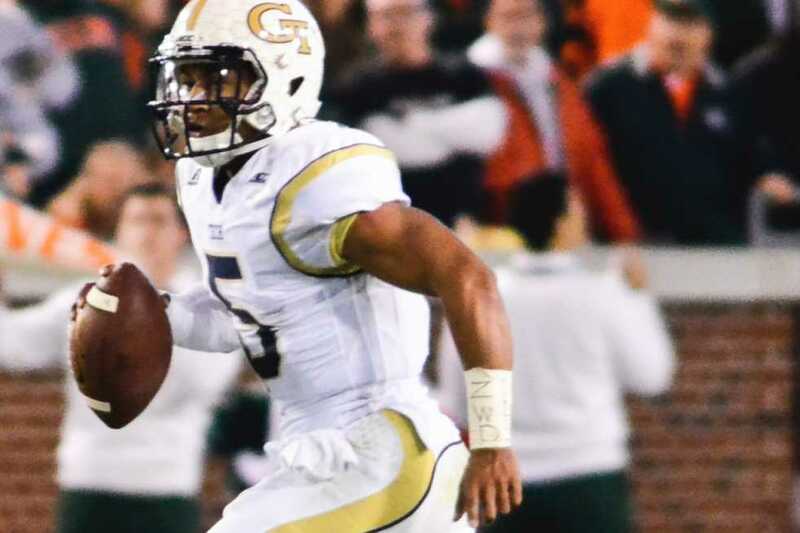 Facing one of the nation’s hardest schedules, the road that lies before the Jackets is certainly full of obstacles. Road contests at Notre Dame, Clemson and Miami will all prove to be very difficult match ups. A home schedule highlighted by games against Virginia Tech and Florida State does not appear to be any easier, either. But within this challenging slate of games lies a golden opportunity for a Tech team that appears to have almost all of the pieces in place. The Jackets’ two hardest conference match ups are both with teams from the Atlantic Division. If Tech can go 6-0 against their Coastal foes, they should find themselves in the ACC Championship Game facing a team they’ve already seen once this season — and the Jackets aren’t the type of team to lose to the same opponent twice. Coming off an 11 win season where Tech won the coastal division, they will look to win the ACC for the first time in six years, but it will not happen this year. Despite Tech having a better overall team this year, they will be tough pressed to match or exceed the success they had last year. Last year, a lot of things went Tech’s way in ACC play. They suffered only two losses in the division and ironically against the teams they had beaten six plus years in a row. They broke big losing streaks against Virginia Tech and Miami and sealed the division at home against Clemson thanks to forcing turnover after turnover. However, a tougher schedule and the loss of many key players from last year means Tech will have their work cut out for them on the offensive side of the ball. Tech lost nine offensive players to graduation who played big snaps for them. On top of that their top two B-backs suffered major injuries in spring and their leading returning A-back, Broderick Snoddy, is coming back from a broken leg injury. However, the biggest loss of the offseason may be A-back Dennis Andrews, who would have been the team’s best blocker for the year. On the perimeter, Tech will have to turn to new faces to pave the way for starting quarterback Justin Thomas and Snoddy. A major key to success that is often overlooked is blocking by the wide receivers and A-backs. At wide receiver, Tech will be missing two players who got drafted to the NFL. It is very rare for both starting wide receivers for a team to get drafted in the same year and even more rare for it to happen in a triple option offense. With four new starters in these two positions and very inexperienced players all over the two-deep, Tech will have to have herculean showings by them to beat the likes of Clemson, Miami, FSU and Virginia Tech. With the major inexperience on the offensive side of the ball and brutal schedule for ACC play, Tech will have a tough time winning the division, let alone conference. If they win the division it means they will likely have to beat Clemson or FSU twice to win the ACC championship and it is very difficult to beat a team twice in the same year.